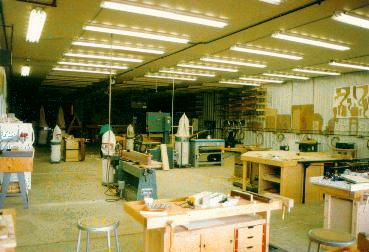 I spent the week of June 17, 1996 at the Marc Adams School of Woodworking. 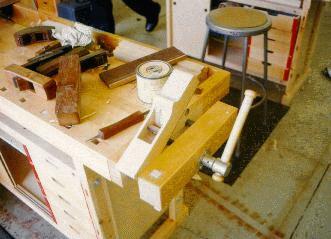 I took "Making a wooden hand plane" taught by Monroe Robinson. Monroe Robinson is returning to teach in 1999. I wrote on the comment card that I would take any class Monroe taught- even basket weaving, he's that good. The building is quite impressive. Power tools as far as the eye can see. It is about one quarter the size of a Home Depot. They have a lot of Jet and Delta tools. They even have a pre-production Dewalt scroll saw. Everyone in the marquetry class drooled over it. It won't be out for a least a year. Not to ruin the surprise, it's yellow. If all of the fluorscent lights are on in the shop it draws over a hundred amps. Update: rumor has it that the Dewalt saw *is* now available. on scrapers - #123 April 1997 p82-85. Monroe is on the cover! He is also in the (now defunct) Summer 1996 Home Furniture issue (page 62). He has started an environmentally conscience lumber business. He harvests only fallen red wood trees without damaging the surroundings. I also heard that he has a video on scrapers though I haven't seen it advertised anywhere. Monroe build a plane along with us. 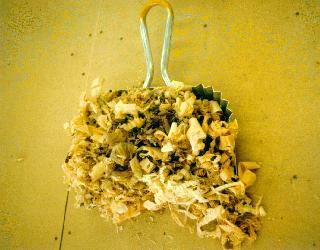 His made shavings of .0015" (one and a half thousandths). Chick here to see some of the 40 planes Monroe has made- including the one he wants cast in bronze. We built Krenov style planes as Monroe attended Krenov's school (College of the Redwoods). Details of the plane's construction are here. Also see Fine Woodworking issue 126 and check out http://www.crfinefurniture.com/ (a site of former and current students). Planes are available in kit form from Ron Hock. Ron also sells the blades your plane will need. Planes our class made. There is another nearby B & B "The Candlestick" in Greenwood 317-888-3905.